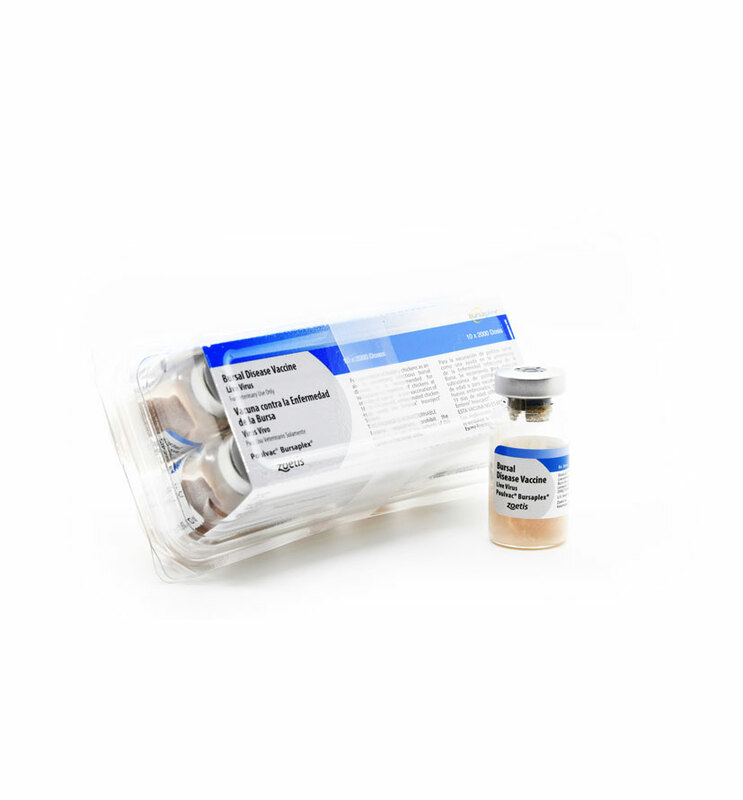 To defend persistent threat of infectious bursal disease (IBD), Bursaplex®, a single-dose vaccine helps broilers develop protection against IBD at an early age. The field-tested live virus/antibody vaccine is effective regardless of maternal antibody levels. Live intermediate plus strain vaccine virus and specific bursal disease antibody. • Bursaplex® is recommended for the vaccination of healthy chickens as an aid in the prevention of IBD. • It is recommended for subcutaneous injection of chickens at 1 day of age or in ovo vaccination of 18- to 19-day-old embryonated chicken eggs using the Inovoject® System with Vaccine Saver® option, an Embrex® BioDevice from Zoetis. • Vaccinate all birds on the premises at one time. In ovo injection or subcutaneous injection at hatch. • Dilute the vaccine only as directed, observing all precautions and warnings for handling. • Rehydrate only the vials of vaccine that are to be used immediately. • For each 2,000 doses of vaccine to be administered by subcutaneous injection, use 400 mL of sterile diluent. For each 4,000 doses of vaccine to be administered in ovo, use 200 mL of sterile diluent. • Transfer enough diluent to the vial containing the lyophilized virus to fill it about three-quarters full. Replace the stopper and shake the contents gently until the vaccine is evenly suspended. • Aseptically transfer the virus suspension into the remaining diluent. Replace the stopper and thoroughly mix the vaccine and diluent by swirling and inverting. • Rinse the vial to be sure of removing all the vaccine. • Use the vaccine-diluent mixture immediately as described for subcutaneous injection or in ovo administration. • Keep the bottle of diluted vaccine in an ice bath and agitate continuously. • Sanitize the Inovoject® System with Vaccine Saver® option before and after use. • Inject a 0.05 mL dose into each embryonated egg. • Use the entire contents of the vaccine container within one hour after mixing. • Important: Before initiating in ovo vaccination, carefully read and follow the operator’s manual for the Inovoject System with Vaccine Saver option. Failure to follow instructions may result in personal injury, embryonic morbidity and mortality. Only healthy embryonated eggs should be used. • Use a sterile automatic syringe with a 20- to 22-gauge, ⅜- to ½-inch needle that is set to accurately deliver 0.2 ml. Check the accuracy of delivery several times during the vaccination procedure. • Hold the chicken by the back of the neck, just below the head. The loose skin in this area is raised by gently pinching with the thumb and forefinger. Insert the needle beneath the skin in a direction away from the head. Inject 0.2 mL per chicken. Avoid hitting the muscles and bones in the neck. • Use entire contents of bottle within one hour after mixing. • Important: Sterilize vaccinating equipment by autoclaving 15 minutes at 121°C or by boiling in water for 20 minutes. Never allow any chemical disinfectant to come in contact with vaccinating equipment. • Store in the dark at 2°C to 7°C.